The coming of peace in 1783 signaled a rise in building construction to accommodate a booming population and also the enhanced ambitions of the victorious revolutionaries. Second only to its neighbor, Schuyler Mansion, and also within the city's borders, this elegant home was located south of the urban core and was built by attorney Peter W. Yates. It sat on a ridge north of the Beaverkill. 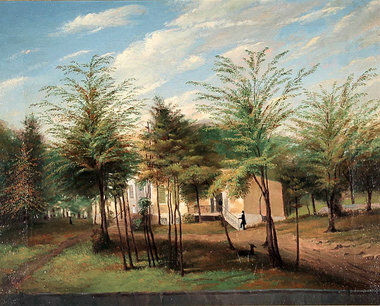 On the south side of the Beaverkill ravine was larger city estate of General Philip Schuyler. The precise construction date for Yates Mansion is not known but it still was unfinished in 1784 when it was referenced by a young visitor. During the 1790s, Yates's family of ten lived in a large house surrounded by orchards and outbuildings. A decade later, the size of his household had shrunk to three adult members and was served by four slaves. Peter Waldron Yates inherited the property in 1776. He paid taxes on it as early as 1779 when it was shown (as a lot only) on a city assessment roll for the first ward. At that time, his actual residence was located closer to the city core. 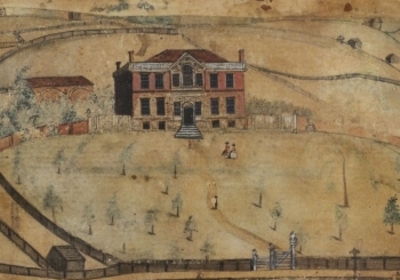 "Yates Mansion" was the subject of a painting by St. John Honeywood done about 1795. It is pictured prominently on the city maps made by Simeon De Witt during the same decade. It also was featured in an architectural drawing. In 1788, his new holdings were valued substantially on the first ward assessment roll. In 1799, the real estate of Peter W. Yates was assessed at $20,790 - making it second only to neighboring Schuyler Mansion in value. In 1809, Yates is said to have sold it to newcomer businessman James Kane. Kane either rebuilt or enhanced the landmark property. The "Mansion" at the corner of Westerlo and Broad Streets later was the residence of Governors Tompkins, De Witt Clinton and Seward. In 1838, Governor William H. Seward described his new Albany home in delightful detail. Growing up in Albany during the 1840s and '50s, one-time resident, Henry Yates Satterlee later became the "first Episcopal bishop of Washington". In June 1856, "the old Yates Mansion on Broad Street" was purchased by Thomas W. Olcott for $16,000 "for the use of the principal of the Female Academy." Then by 1864, it had been sold again (to the Ash Grove Methodist Church) and was demolished by its new owner to build a new Ash Grove Methodist Church. That building is said to have been razed in 1918. Yates Mansion was one of the landmark homes of of post-revolutionary war Albany. 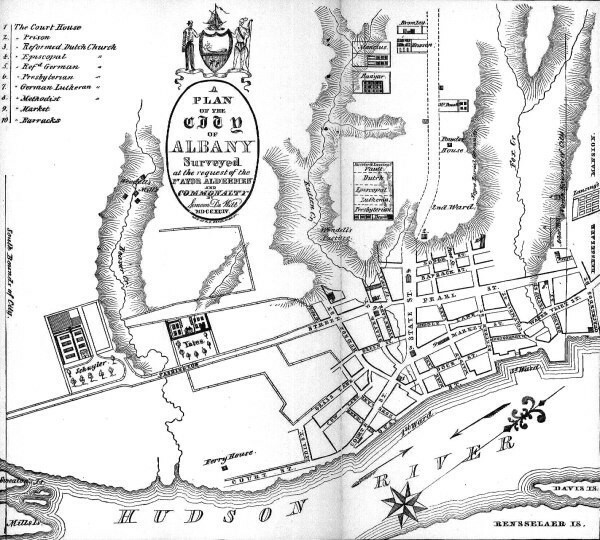 The built environment of early Albany is considered more broadly in a theme essay entitled "Homes for the People." 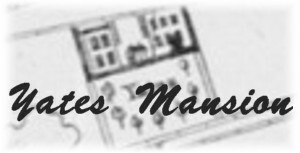 Sources on Yates/Kane/Seward Mansion: Start with the article by Paul R. Huey in Albany Architecture, beginning on page 55. The purpose of this offering is to locate and consider the site and building over its first decades of existence. Any unique perspectives focus on its first owner. We have not considered the architectural, material, and later history of the property. For the building itself, begin with a Google.com search on the subject. Detail from often encountered overview maps of Albany showing city boundaries and street plans made by State Surveyor General Simeon De Witt during the 1790s. Engraved prints exist in a variety of forms and widely accessible. I call this iconography "Development Maps" as the laying out of all subsequent streets represented a blueprint for the expansion of the city. City maps from the nineteenth century become increasingly more detailed. Detail from a larger watercolor on paper painting entitled The Home of the Hon. Peter Waldron Yates, Albany, NY by St. John Honeywood - a one-time student in Yates's law office. It is dated about 1795 and in the collection of the Albany Institute of History and Art. It also was reproduced in Journals of Lt. John Enys. Article on the property.